You may recall my occasional posts regarding a Screech Owl(s) that have called the Flicker nestbox next to my driveway home for several years now. Faithfully, every Spring, a pair of Screech Owls lays claim to the box and whether or not young have been raised there, I never really knew. I have found broken owl egg shells near the box and often see the owls exiting at dusk and just peeking out in the day. But recently the owls fate has become tragically known. One morning this week, I was outside my garage and something on the ground on the concrete caught my eye. The adult Screech Owl was on the ground, not 10 feet away from me, looking at me with heavy eyes. The sunlight was obviously uncomfortable but the injury I saw made the glare of the sun on this nighttime raptor, insignificant. Its right wing hung by a small thread of flesh, dried blood caked on its feathers and wing bones protruding grotesquely. I knew (s)he was in trouble and was beyond any hope of ever flying again. At best she would retain her life, but her gift of flight was gone forever. Glancing at the nest box I wondered about its contents. My spouse got the ladder and climbed up and heard soft calls from inside and within the box were 2 of the cutest white powder puffs of baby owl, I have ever seen. There eyes squeezed shut, it was hard to make out heads or tails of the little fluffy balls. We removed the babies for about 5 minutes while we made some repairs to the front of the nest box which will not make it through another year and while waiting for a call back from Busch Wildlife Sanctuary to determine what should be done. I looked them over and they seemed to have empty crops but otherwise unharmed. The folks at Busch Wildlife told us to observe the nest box as the surviving owl would return during the day (which I thought was odd) and resume care of the nestlings. My fear being that the adult that was injured was close to the nestbox and was obviously caused by some predator. Either the hawk saw the male owl roosting in the tree by day and mangled it or a Horned Owl (common in my area) or Raccoon found the nest box during the night and attempted to pull out the female. In the ensuing struggle the little screech must have been able to tumble free and land in a large section of thick dense shrubs that surround that side of our house. I can imagine her laying in the bushes and making her way out to the concrete in the hours that followed. A careful search of the trees close to the nest box uncovered no other owl roosting and as dusk approached, no other owls came to feed or care for the youngsters. Like the purple martins, after being attacked by such fearsome predators such as Raccoons or Horned Owls , the mate (if it survived) probably fled for its life and would unlikely return. I watched from a vantage point that I would often sit to observe these little Screech Owls and no mate ever returned. My hopes for these 2 little owls fledging from our nest box diminished and I decided that a Wildlife Rehabilitator would be their fate. 4 days later, at Wildlife Resource Center of the Palm Beaches, I am told that the babies are doing well and eating up a storm. 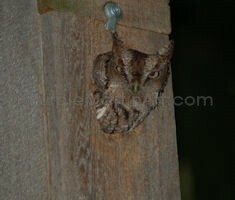 As for the adult Screech Owl, Busch Wildlife Sanctuary has YET to return my multiple calls. Many thanks to Ellen from Wildlife Resource Center of the Palm Beaches. I think I have found a new Wildlife Rehabber! The sun broke over the horizon none too soon. Waiting till 9AM was the hardest part. I drove to the Folke Peterson Wildlife Center and Faith (their Veterinary Technician) brought Beau out to me. He was beautiful and looked so much more grown up. His little baby beak looked like that of an adult. The only way I could tell that he wasn’t, was his stumpy fledgling tail. Of course, the deep notch would develop during his maiden molt. I drove home with him very calm and quiet in the animal carrier. When I got him home, as soon as I took him out of the car, you could hear the Purple Martins chirruping in the back. He heard it too and called out with a big birds voice. My heart was racing. I am sure his was too. As I rounded the corner to the back yard he started to call out continuously which made all the Martins fly up and circle, as if they were looking about for the wayward fledgling. Eventually they settled back down on the housing and I sat the carrier within 30 or so feet of it. I removed the towels from the carrier so that he could see around. He patiently just sat there looking alternatively at me then at the other Martins perched on the housing. I wondered what goes through a little bird brain at a time like this. I didn’t want to torture him any further. I quickly opened the door and he sat on my finger only a moment before he flew off towards the housing. He veered off when all the other Martins flew up to meet him. He was greeted with a customary razing by the older birds. He darted, he turned, he gained altitude and he flew off to the south with 5 or so birds in hot pursuit. He came back to circle the housing a few times with a handful of Martins flying in circles along with him. No longer harassing, they all just flew about in their usual joyful, easy way. And my heart felt the same way. Light and free and happy. Little Beau…my prayers are for you to achieve the independence and skills you will need to be part of the circle of life. If your future includes returning to my site, all the more wonderful. Have fun in Brazil, little Beau!!! The trials and tribulations of being an overly obsessed Purple Martin Landlord. Hmmm, I am sure that this whole ordeal has shaved a few years off my life. BUT all is well that ends well. Let me start from the beginning of the day. AM: I called the Folke Peterson Wildlife Center. I asked to speak to “anyone” as all the times I have called regarding the fledgling, I spoke with the receptionist only. They transferred me to the Executive Director, Heather Landstrom. We had a nice long talk. She told me that she had received a few emails in regards to the Purple Martin. She had just had a meeting with the Veterinarian and wanted to be kept apprised of his situation. She was told that he had come to the center dehydrated and underweight. That he was doing well and they wanted to flight test him sometime early next week. I agreed that him being flight tested was a great idea and I was wholeheartedly behind that idea. As soon as he passed his flight test, he would be released ASAP, preferably at his natal site. I was THRILLED. I told her all about how fearless Purple Martins can be of humans. That for hundreds of years, these birds have nested almost exclusively in man-made housing. That these birds thrive within close proximity to human activity. How Indians would put gourds up for Purple Martins and benefit from a mutual symbiotic relationship. She was very cordial and showed great interest in Purple Martins and little Beau. I was reassured that I could call on her personally and would be kept in the loop of any and all developments in Beau’s care and release. PM: I received a call from Dr.Dacia Oprisanu. She told me that a flight cage became available and that they had just flight tested the young martin. AND that he FLEW!! I was so happy and excited. She even told me that I could pick him up today to release him at his natal colony site. (HOME!) I didn’t think today was a good idea as most of the martins were already off feeding for the afternoon. The parents that are actively feeding are here, of course, but I felt that an early AM release would be perfect. Activity here is always busiest from sunrise till about 11, then it tapers off to a ghost town till about 4 pm or so. So, that’s what today brought. Answered prayers and hope for the future of a little bird named Beau. Lessons learned from my experience with Beau, my grounded Purple Martin Fledgling. #1 Make sure the phone number you have for a rehabber actually works, Nothing worse than calling a number when you need it and the line has been disconnected. #2 contact the rehabber BEFORE any problems, forge some kind of relationship where they understand your role as a Purple Martin landlord. Just because a rehabber works with birds doesn’t mean they work with Purple Martin landlords. #3 Bring them donuts or coffee to maintain open friendly communication. A little grease goes a long way. Why do I say all this? Well, the good news is Beaus prognosis is “Excellent” and he is “Eating well” And that is all the info I can get on him. I would get more info calling the White House to get the Presidents prostate exam results. Not that they don’t know what they are doing. Actually the opposite is true. It is a large wildlife hospital and has State of the art facilities. But bigger usually means more bureaucracy and the little people get lost in the mix. They have alot more important things on their mind than placating a Purple Martin Landlord, I know. I don’t feel like they understand a landlords role as an active conservationist. Maybe I’ll make those donuts jelly filled. The colony is doing great. The recently fledged young come by during the day. Some nest in their gourds, some don’t. Seems like they are still staying together in family groups. Several SY males have taken to claiming the gourds during the day, trying to attract a mate. The ASY males chase them off when they return with the young occasionally.